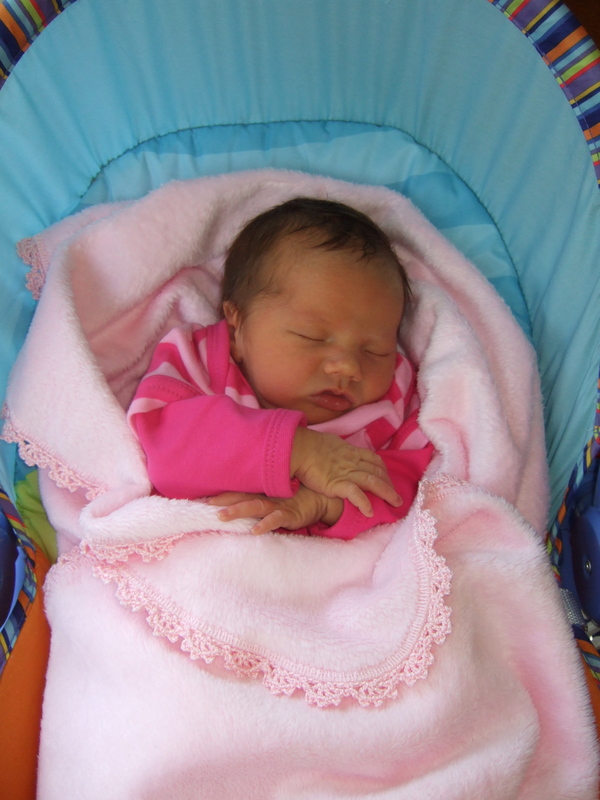 I know, I know – 2 blog posts in 1 night is a bit much but Lexi turned four today, and I wanted to record the ocassion for posterity! This birthday has been long awaited as ‘the day before our big trip starts’. So, I know I am going to regret this when she uses it against us forever more, but it was not the greatest birthday event we’ve ever put together. 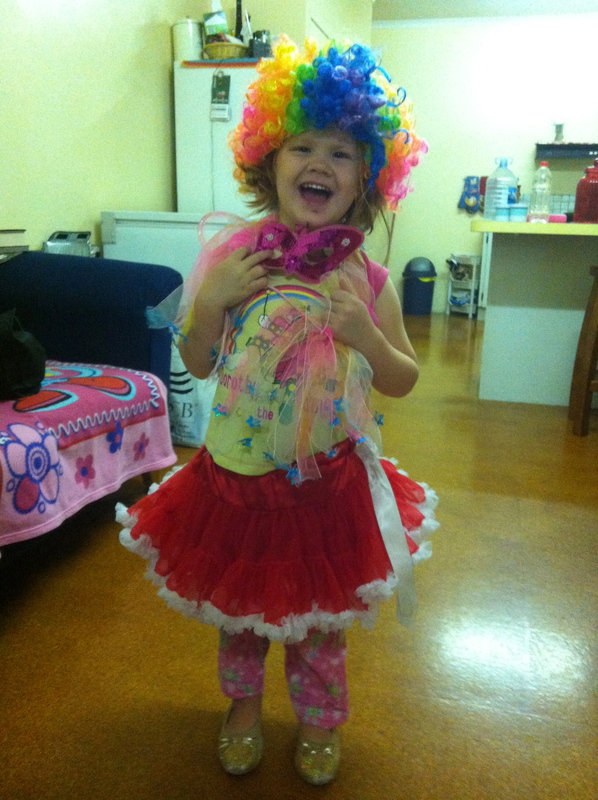 To start with, aaaargh – I’m so going to regret admitting this – we haven’t yet bought Lex a present. Lucky for us friends and family had mailed some pressies down to us so she did have some goodies waiting on the camper table today for her when she woke up, but we just haven’t had time/figured out what we are getting her yet – terrible parents. I also didn’t make her a cake. Choosing a cake from the ‘Women’s Weekly’ cake book is a bit of a tradition for our kids, but I just couldn’t get there for Lex this year (but I did make cupcakes for her to take to Kindy on her last day on Wednesday so surely that counts for something?!?!). We didn’t have a party for her – she asked all day ‘when are my friend’s coming over?’ – ouch! And here’s the worst bit ………. I organised her 4yr old vaccination needles for today – yep – a needle in each arm for her birthday because I wanted them done before we hit the road. We are never going to be able to live this birthday down! Despite all this she still had a pretty good day I think! She was spoilt rotten with gifts from friends at school and my wonderful workmates at BMR had even organised a cake and candles and a bag of Freddo Frogs for her when I dropped in today to get some paperwork signed – so grateful to the BMR crew! 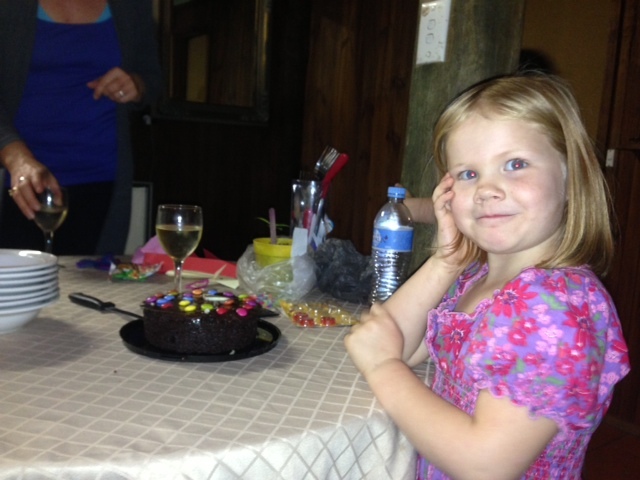 We finished the day with a Pizza dinner and a Coles mudcake with the Hanstede family. 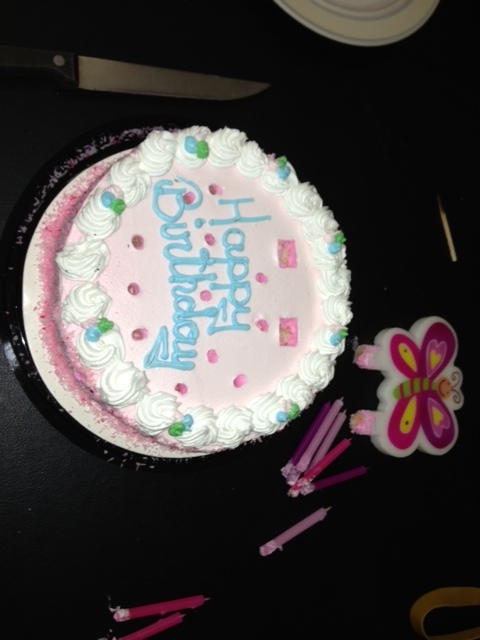 The lovely birthday cake from the BMR crew – saved my bacon and made Lexi’s day! 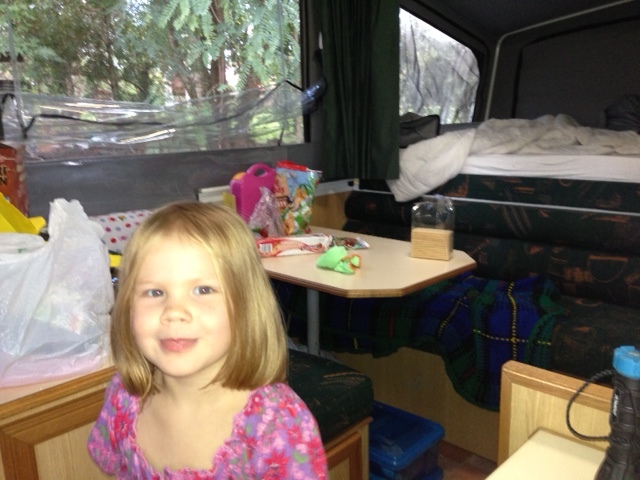 The birthday girl in the camper – yes I did let her eat half a packet of cruskits for lunch because I could not get into the cupboard to organise anything else – no judging!! I’m going to finish below by inserting the email Matt sent out to the friends and family after Lex was born, just thought I’d include it here as a record for ever more – some of the ‘in-family’ speak won’t make a lot of sense to those of you who’ve never actually met us but you’ll get the gist! So off we trot to the hospital, I was starving and wondered if it would be at all inappropriate to take a labouring wife to Hungry Jacks drive thru at 5am. Turns out it is. Who-da-thought? I don’t think the drive thru opperator will forget this day in a hurry! So the orderly, Pad Thai, got the job of wheeling Jess to level 5. The terror on his face was not quite as sublte as in Jess’s voice earlier. On arrival at the lvl 5 baby factory, Karen Yates’ twin sister ushered us into suite number 1, which I thought was ironic, being that Jack was born in suite 3 and Lexi was to be born in suite 1. Anyway, ‘our’ birth plan was simple. Eppi at the door thanks! Unfortunately, the public health system had other ideas because all the anesthetists were in theatre so Jess had to wait patiently. Now anyone who knows Jess, knows that patience it not one of her many strong qualities. 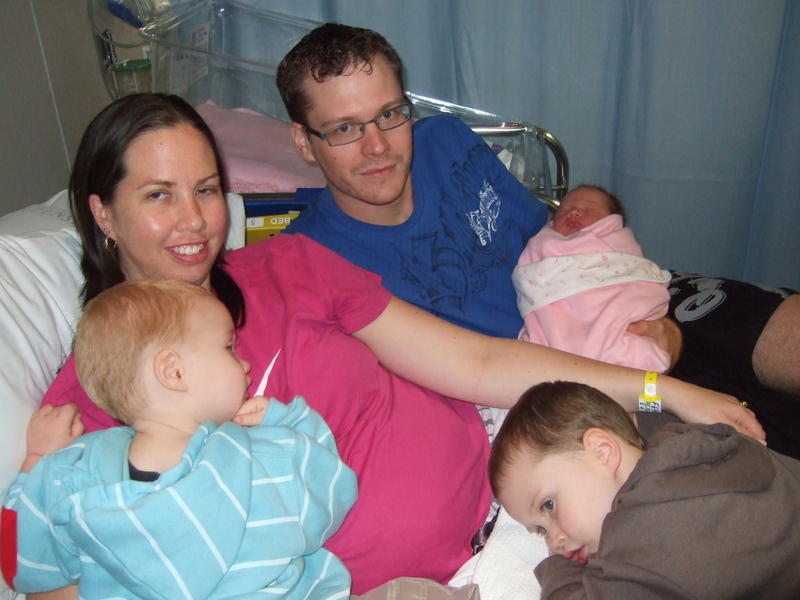 Now imagine Jess, being patient, in the throws of labour…. yeah, and I still believe in the tooth fairy! So I tried to slip Karen’s twin sister a ‘fiddy’ to get the eppi happening. Now even though Karen’s twin sister could take the AUD$50 back to ‘Un Zed’ and buy a new car or something, she didn’t seem interested. So I gave her what every New Zealander really needs, a copy of ‘The Dummies Guide to Rugby’ which I just so happened to have in my pocket. This got things moving along and before we knew it the anethisitist ‘McSteamy’ was ready to go. It seems Lexi had other ideas though because while McSteamy was trying to paint picasso on Jess’s back with antisepyic wipe, Jess ‘quietly’ mentioned that she had to push. Karen’s twin sister didn’t believe her and told her keep sucking the gas, Jess then even more ‘quietly’ mentione that she just pushed, Karen’s twin sister decided she had better have a look and low and behold there was Lexi sayin’ hello. One more push and she was out!Now, for all the women scanning this email for the details.Lexi in the pink corner has tipped the scales at 3.215 kg (7pound 1oz in yesteryear speak) Meaning she is officially the fattest of them all, and based on her instant attachment to the feed bags, she will probably maintain this title for a while. 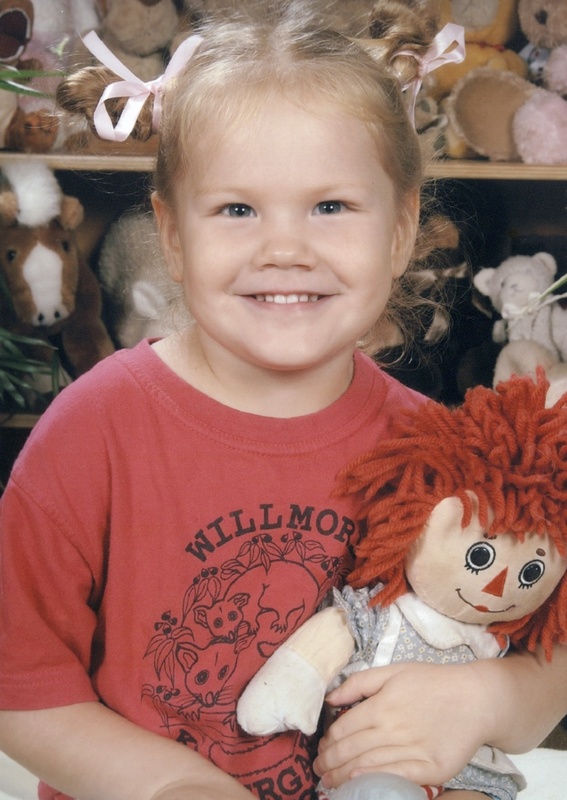 She was 49cm long (19 1/2 inches) with a head circumference to match the other girls in the house. So both the ‘gals’ are doing really well, Jess has once again totally amazed me, and Karen’s twin sister as it turned out. Now sorry about the photos, I have left the good camera at hospital so these are just from my phone. Better ones to come. 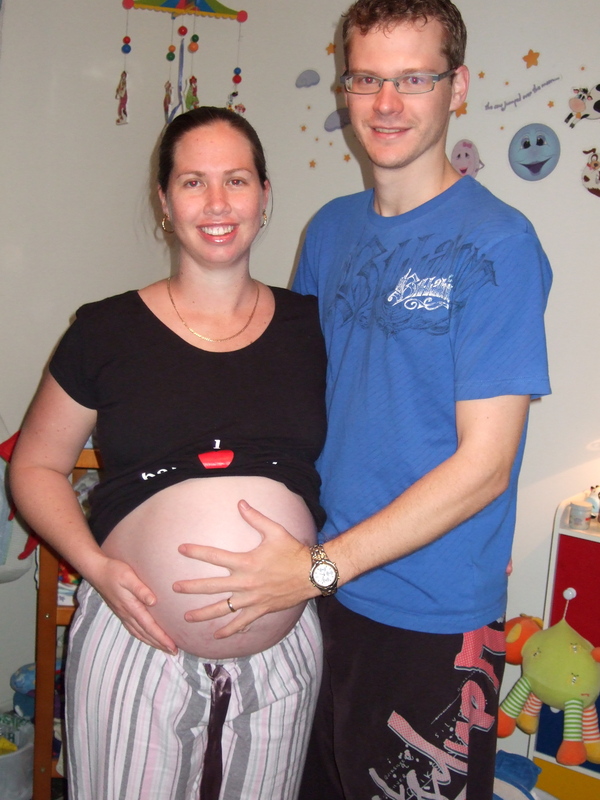 Lexi the Baby Bump – oh we look young and that was only 4 years ago! 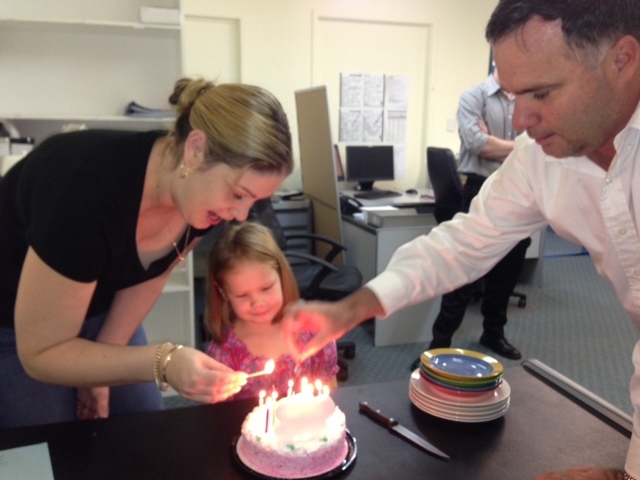 So happy fourth birthday Lexi Lou – we’ll do better next year! Love you lots xoxoxox Mum, Dad & the boys.